Well I’ve had this book on my bookshelf for a few months now as I’ve been catching up my backlog of books and I’m so happy to have finally read it. I have read a few other recent reviews lately and while they outlined a bit of the content covered in the book, they never expressed a lot of personal effect the book had. I want to share mine and my main comment is that this is a fantastic book. Not only for a manager but anyone wanting to manage their lives and the lives of those around them better. From the title, I expected the book to teach me how to be the dream manager, which I thought would be one that people would dream to have or the best possible manager. 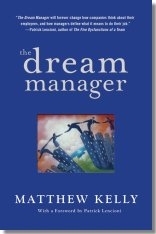 The funny thing is as I started reading and found out quickly what the dream manager was, the book wasn’t directly teaching that at all. I love the ideas and as I got further into the book and realized that the concepts put in practice do need to be in place by any manager, I fell back to thinking and definitely think it now, that doing what this book teaches, will make you the dream manager. A manager who puts the dreams and ambitions of an employee first in order to build them up only on the hope and knowledge that that will pay back more in the future really is what the ideal manager is. As I continue to learn in so many ways, put people first and the rest falls into place. The story is captivating as I couldn’t put the book down wanting to find out the impact of the new initiatives and programs put into place in the story. The book is written as a fable (my favorite style of business book as I find it far more applicable to real life) about a janitorial services company struggling with a massive turnover problem. An innovative approach that is used and demonstrated in the story is that of a dream manager program. The program all started out by the company doing a survey to find out what the employees think causes the high turnover. This led to recognizing some common goals among the employees and the idea that a dream manager hired on at the company could help to facilitate the dreams of the employees. This would in turn help employees feel like the organization truly valued them and that they would ultimately feel more loyalty to the company and be more productive with their work. The presented concept in the story delivers many times over with the turnover problem and the company sees massive improvements in employee productivity and profits. Our employees are our first customers, and our most important customers. Anyway, I put a lot of value on the ideas presented and to the extent the dream manager program were taken in the book. I personally believe 100% in developing people first and seeing the results of that back to the organization second and this message is clear through the story. The book has given me a new spark to maximizing the use of my own one on one times with my team to look at new ways to explore their dreams and help them achieve them. I definitely want to look for ways to bring this into other practice with other managers and the book provides a number of techniques to start doing this, all of them realistic and quite practical. The other thing that Kelly does very well with the book is that he adds a practical handbook section after the end of the fable to explore ways to put this into practice. The best part of this is that he doesn’t limit it to managers. He covers ways to start no matter where you fit into an organization and even more unique in a “business book” is that he looks and discusses how this can be used in other areas of your life with family and friends. This is definitely one of the top books I’ve ever read for business and management and it was highly useful and will definitely make an impact on my work and more importantly, the work of others that I manage. I can’t wait to put some of these into practice and see the effects it will have in the workplace. I absolutely recommend this book, especially for any manager! I can remember how overwhelmed i was reading the book. LOVED IT A LOT and learned a lot too. After reading your post I feel like I have read it again and I have this positive burst of energy. I am intriguing about the book and its tittle and its style.In the nearest days I will try to get it.Not long ago thought I should find something special and necessary just for me in the time of being.I am sure that is the right thing I need.